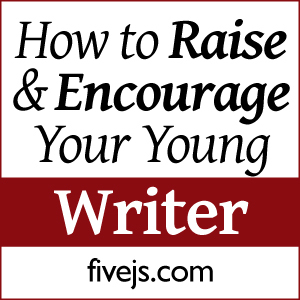 This is my husband Jeff's third post in his series How to Raise & Encourage Your Young Writer. I made mention last time of ways to encourage the young writer in your household. One of the things on my list was something to not do, namely trying to offer critiques during the creation stage. There’s ample time to give your advice, but the fragile beginning stages of a story is not one of those times. Think of it this way. Imagine an architect has been tasked with drawing up the plans for a new building. He sits down at his desk, pulls out paper and pencil, and proceeds to draw a quick sketch of a structure that he's pictured in his mind. Now imagine that he takes that sketch and shows it to a close friend or his spouse to get their reaction. How do you think that architect would feel if those he showed it to criticized the fact that his sketch is still rough? It doesn’t reflect perfect, real-world perspective and proportions. It has extra lines here and there where he didn’t erase cleanly, if he erased at all. They say a construction crew could never use his drawing to build a building. You get the point. It’s a rough sketch, a first attempt, not the finished product. Your writer’s work during the creation stage is the same. No one writes a perfect first draft. In fact, it's hard to write an acceptable first draft. So then, how do you critique your writer’s work when the time is right? That can be a touchy proposition, and the answer is that it’s all about trust and honesty. You’ve probably heard it said that with children—or with people in general really—you should give two or three positive comments for every negative one. For writers, and pretty much for anyone who delves into a creative art, theirs can be a somewhat fragile ego. Your praise to criticism should probably approach something like a 5-to-1 or 10-to1 ratio. The truth is you have to build and keep your writer's trust. You build it by letting them know above all that you love them, and you love their creativity. They've trusted you enough to let you read their creation; make sure you understand and stay worthy of that trust by nurturing and protecting their art first, and critiquing it second. The reality is this. How do you feel when your mother-in-law criticizes the way you take care of your children? That’s how your writer feels when you criticize his writing. Always remember first and foremost, your critiques are meant to help your writer. Give your writer concrete reasons why you’ve found a problem with their writing. Grammar, punctuation, and spelling mistakes are easy to point out and justify why they need to be corrected. The easiest thing you can do is simply point them out and let them make the corrections. Don't turn it into a lecture on sentence structure; let them take the opportunity to figure it out. Self-correction is often the best way to learn the mechanics. For other issues such as plot, dialogue, characterization, pace, setting, and so on, you need to be able to tell your writer why you think it needs to be rewritten. You’ve got to be able to justify the reason. If you can’t explain what’s wrong with it, then you can’t expect them to fix it. Here's an example. Instead of telling them that a section was "slow" and leaving it at that, tell them why you thought the pace was dragging. Show them where their sentences were a bit too wordy, or where they could use less description of the setting. Demonstrate, if you're able, how shorter sentences help quicken the pace for action sequences. Don’t blow smoke. Make sure you give only honest praise. Frame that praise in such a way that you reinforce those things they’ve done well so that they replicate those traits. Keep in mind that, even though you mean well, and even if your critiques are valid, they can still sting. Having said that, realize that sometimes you’ll be required to sting. If you don’t, you run the risk of falling prey to what I call American Idol Syndrome. If you’ve ever watched the auditions for American Idol, you know what I’m talking about. There are always people who try out for the show who are horrible singers, but they think they’re wonderful. It’s too bad that no one in the family was brave enough to be honest with them and tell them they need voice lessons. Do everything you can to not crush the spirit of your young writer, but don't lie to them or keep silent about issues with their writing or storytelling that needs work. Just like those kids who should have gotten some voice lessons, get your writer the help they need. If you can't help them, try to find someone else who can. 1. Point out one issue that needs correction at a time. Don’t try to raise everything you found wrong all at once. This is why writers go through multiple revisions of our stories. We correct issues with each successive pass, often focusing on one problem at a time. 2. Demonstrate alternate solutions. If a sentence, paragraph, or section needs work, offer them some ideas on how to correct their problems. When you give only one way to fix the problems, it may come across that your way is the only way. You don’t mean to come across that way, but you very well might. 3. Praise what’s done well often. Don’t just offer general statements like, “That’s good.” Tell them specifically what you thought they did well and what you liked about the story. 4. Try to know when enough is enough. It’s possible to rewrite the life out of a story. Sometimes the best told version of a story is the one that’s poorly written. Writing is an art, and it will take your writer time to learn the balance between following the mechanical rules and writing an engaging story. How have you found success critiquing your young writer's creative works? Please share in the comments.